Vegetable Tempura usually comes with your Shrimp Tempura in the Bento box. They complement the shrimp and the variety of vegetables gives you different textures and flavors. Just like the Shrimp Tempura, using just the batter will only keep it crunchy while it's still hot. 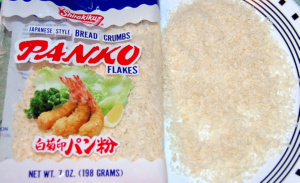 Adding another step like dredging in Panko, or Japanese breadcrumbs will keep the coating from getting soft and soggy. The batter in this recipe is just slightly seasoned, salt is sprinkled in the end once the veggies are taken out of the oil, like how you would french fries. Both cornstarch and all purpose flour are used for the batter. The cornstarch will not leave the coating too cakey. It is the dipping sauce you serve it with that will give it the taste. Ice Cold Water is essential for the crunch, too. For hard or tough vegetables like sweet potatoes, taro or carrots, cut them in thin slices to easily cook through. For softer vegetables like zucchini, cut them in 2-3 inches long strips, like how you would green beans. 1 Mix together the batter ingredients and place inside the refrigerator while the veggies are being prepped. 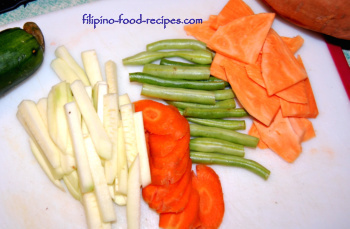 2 Prepare the vegetables by cutting to desired sizes and thickness. Set aside. 3 Take out the batter mix from the refrigerator and dip each vegetable slice, then dredge in the breadcrumbs. Repeat for all before you start frying. 4 Heat up the cooking oil using medium low heat and drop in the vegetables one by one without crowding them in the oil. 5 Cook until golden brown about 3-4 minutes, then set on a paper towel to drain excess oil. Sprinkle with salt and pepper. 6 Serve with the dipping sauce. Use any dried breadcrumbs, or make your own by toasting loaf bread(Tasty bread) slices in 300°F; for 10 - 12 minutes or until dried but not browned. Shred or pulse in food processor and use. Once you dredge in breadcrumbs, make sure you pack the crumbs tight onto the vegetables to keep them from falling off during frying. 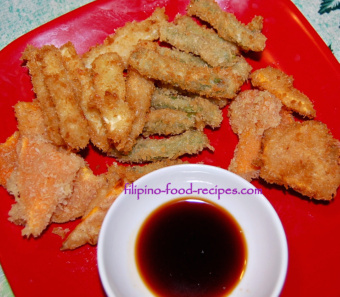 Pair your vegetable tempura with Shrimp Tempura since they use the same batter ingredients.